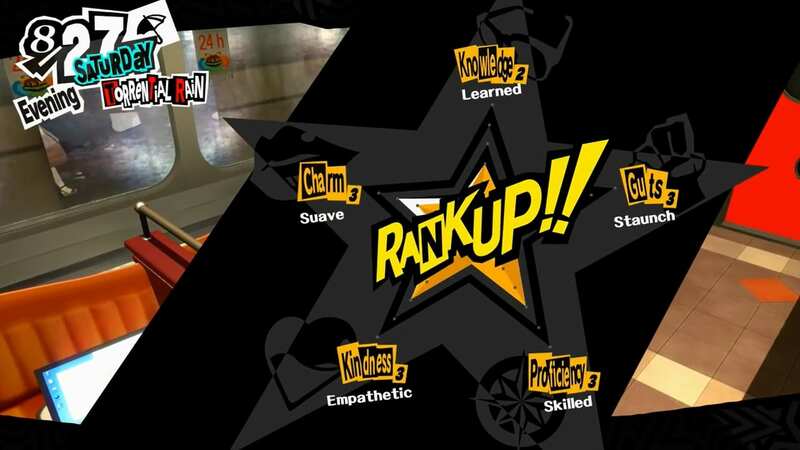 Here is a breakdown of the social stats that need to be improved in Persona 5. Also included is the amount of points needed to increase each rank. ※ UPDATE: 02/12/2019 – Added points required to level up. Same with older Persona games, the player has a number of social stats to improve in order to advance the story. Persona 5 has two more stats than Persona 3 (Courage, Charm, and Academics.) Persona 4 has the same number of stats as Persona 5 with Knowledge, Expression, Diligence, Understanding, and Courage. The main difference, however, is that Persona 5 needs fewer points for a particular stat to be boosted. Also, Persona 5 has more ways than the previous games to rank up these Social Stats. This is especially useful since the game is based on real time. Each stat ranges from 0-5. These stats can be increased by earning points in activities. After obtaining a certain number of points, the stat will increase. This then allows you to access certain events that require certain levels of the various stats. Numerous activities increase the player’s social stats. Each activity affects a particular stat. Additionally, there are some activities that boost 2 or more stats depending on the nature of the activity. Stats can additionally increase when increasing Social Links with Confidants. Players can unlock various events by levelling their social stats. Some of these events involve Confidants. Certain girls will only date your character if a particular trait has been maxed out. Others, like Proficiency, can be helpful on the field. Players can create lockpicks that open chests that contain extremely valuable items. Higher proficiency makes crafting these picks much easier. Social stats offer some additional benefits as well. For example, increasing your Knowledge allows you to perform better during tests. Charm helps mainly in unlocking more part-time jobs. Guts grants you the bravery to face people on special cases. Finally, Proficiency makes you more efficient at crafting infiltration tools and unlocks more part-time jobs. Don’t forget to get your fortune read. Doing that then going and working at the flower show levels up kindness real quick.